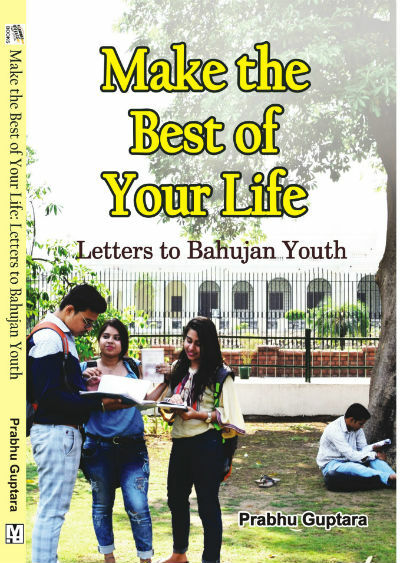 Recently I came to know about a book named Make the Best of Your Life: Letters to Bahujan Youth by debutante author Prabhu Guptara. The author went ahead to provide a book review copy to us and from our team I got a chance to read and review it. As the name suggests, the book is a compilation of (fictional) letters to the protagonist and his wise and clever answers for the same. As the book is a collection of various letters concerning vairous problems or queries the majority of people in the society often consider, the review format of this book will be quite different. Our standard book review format where we distinguish the plot and our views and reviews doesn’t suite this book. So it will be a little different. We will talk about the book content and share our views and reviews for the same in a weaved manner here. Here are a couple of books which are quite similar to this one in terms of format. Also one needs to understand the word “Bahujan”, as due to some political reasons, many people often consider it referring a specific group of people. In literal means, it refers to the majority of people. Remember the slogan “बहुजन हिताय बहुजन सुखाय”. The book is comparatively smaller and is for those readers who love to read something substancial. If you don’t shy away from the real problems and situations, this book is for you. The Preface of the book needs to be read. It says why it is required to write this book for the author and why it is something a reader should read. If I am asked, which message from the book I like the most, I can summarize it as Communication is the key and Love is essential. It is very strange, but we sometimes understand ourselves only when another person puts our feelings successfully into her or his own words. The most important thing single thing that one can do to keep optimal health is to avoid tobacco in any form: cigarettes, cigars, beedis, or whatever. To add to the messages, the book also talks about the importance of holidays. One needs to recharge him/herself and taking a break from the routine does the trick. And, actually, the real world is there for us to explore. The more we see, the more we know and thus we become better version of ourselves. The importance of love is mentioned in this book quite effectively. Actually, the following segment, I found quite effective as a parenting lesson also. Usually, the more we are accepted, loved and cherished in our own family and by our friends and community, the more able we feel to take the risk of being ourselves with a wider circle. That is a psychological matter, and has deep roots. There are questions of getting married and settling down abroad. This is a big dilemma for any girl who is getting married (or about to getting married) abroad. While there is a possibility of meeting with better life and interesting opportunities, no one can deny the possibilities of harsh conditions as well. Dadu says that almost any decision has to be taken based on whatever information is available and by analysing the situation at the best we can. At the end of the day, every choice can only be made in the light of imperfect knowledge. The book talks about many interesting and more importantly necessary topic including education, parenting lessons, study in home country and study abroad, sportsmanship, jobs, career, how to be a part of a team and eventually lead it. The book also talks about interview and gives some job hunting tips as well! It has some tips for the interviewers also! And yes, it talks about an important issue, bribing! So, overall, the book has a lot to offer. And, it is mostly written in easy language. The stuff could have been a boring lecture, but the author doesn’t lose the command and is able to keep it interesting. Of course, you may be agree with all the thoughts the author has, for example the colonization and its effects, or the foreigners brought really good things, or casteism is all bad. Any system, when designed, developed and implemented, has mostly done with the genuine intentions and are setup in unbiased manner. Eventually, with the time, several opportunists twisted the interpretations and used it for their own benefit, making it harmful to the society. And yes, there is no need to accept everything. Just take away what you find worth from it, and you will feel enriched! A simple collection of wisdom messages. Needs to be read with an open mind.